LiveCode LessonsLiveCode LessonsHow To - LiveCode Mobile Tasks Getting Started with AndroidThe Basics: How do I Create Hello World on Android? 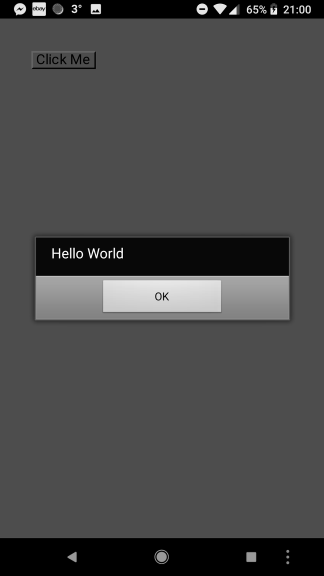 This lesson describes the very basic steps of creating an application that runs on Android via LiveCode. Screen captures and sample code are provided. The lesson bridges the gap between installing the Android development environment (covered in lessons: How do I Become an Android Developer on a Mac? and How do I Become an Android Developer on a PC?) and implementing the first LiveCode application that runs on an Android device. The code is very elementary and the steps are very detailed, focusing primarily on the mechanics of implementation and deployment. Note: This lesson assumes that you have already installed and configured the necessary packages to begin developing software for the Android platform. 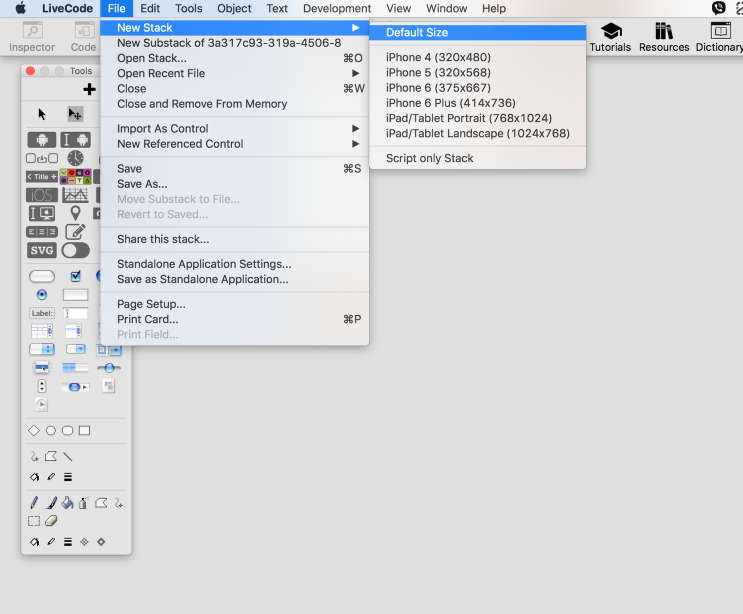 Open the LiveCode IDE and create a new mainstack by selecting File -> New Stack -> Default Size from the IDE panel. This creates an empty stack on which you will be implementing the application. 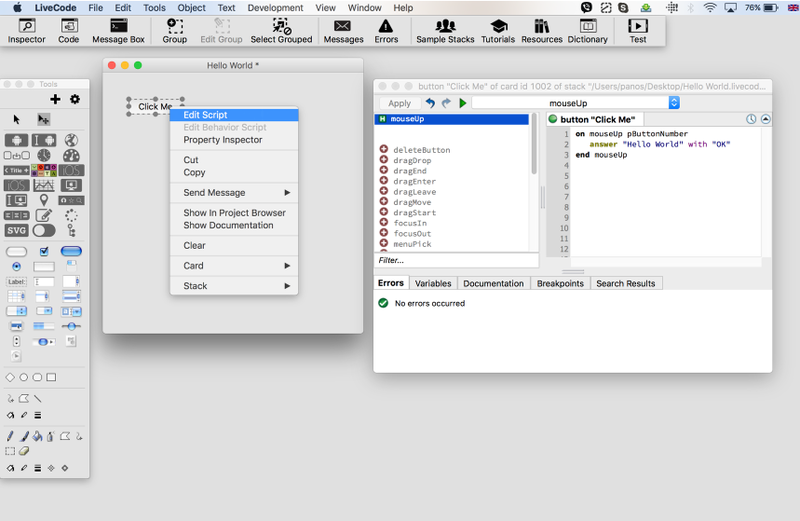 Drag a button (1) from the IDE Tools onto the new mainstack (2). Right click on the mainstack window you created to open a dialog window, then select Stack Property Inspector from that dialog. Change the contents of the Name field from Untitled 1 to Hello World. Select the button you just dropped onto the mainstack window and the Property Inspector changes to display the properties of the button. Change the Name of the button from Button to Click Me. answer "Hello World!" with "Ok"
Then select the Apply button. You have now implemented your Android application and are ready to launch it on an Android device. In this lesson we are using the emulator to simulate an Android device. 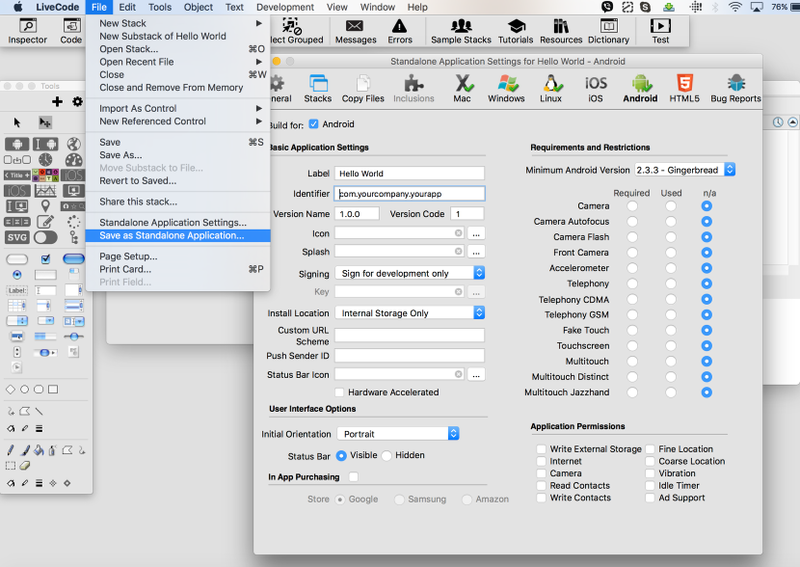 Launch the Android emulator from your Android SDK and AVD Manager. Lessons: How do I Become an Android Developer on a Mac? and How do I Become an Android Developer on a PC? would have shown you how to configure and start your simulated Android device. Note: The emulator needs to be running for LiveCode to launch your application. Select File -> Standalone Application Settings ... from the IDE Panel. This launches the Standalone Application Settings dialog. Select Android as your target and ensure that the Build for Android tick box is selected. You should be able to use the default settings. The last step is to select the deployment target from Deployment -> Test Target. You should be able to select the emulator that is already running. This enables the Test button that launches your application into the Android emulator. 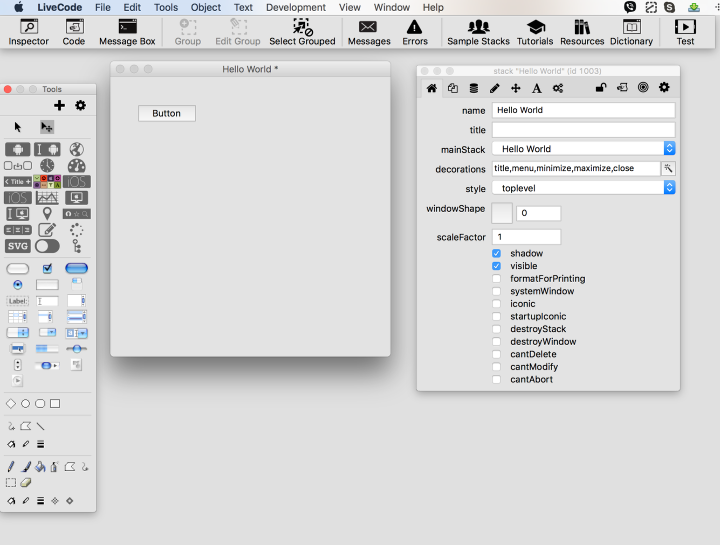 Once the application has been launched and is running in the emulator, you can interact with your application. 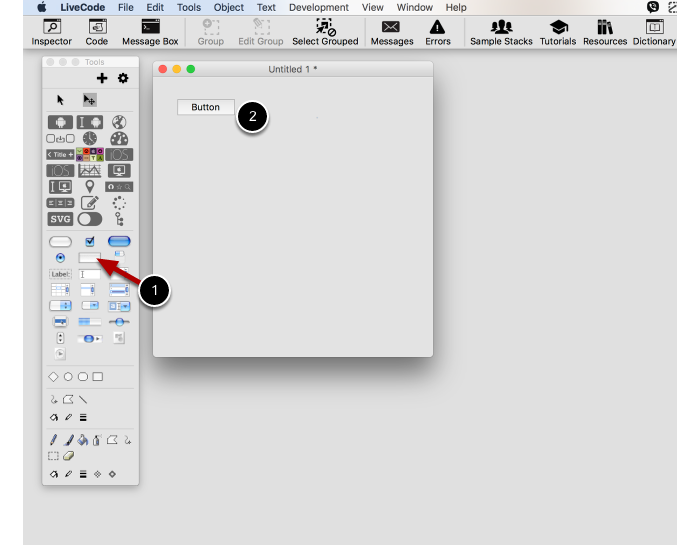 Try selecting the Click Me button to raise the dialog. Then select the Ok button to dismiss the dialog again. Next: How do I Become an iOS Developer? so i went to development->plugins->and there is no revandriodplugin !!!! Android deployment has now been integrated and the plugin is no longer required. This lesson has now been updated to show the new process for building and deploying to Android devices. what am i missing.. can't select "test target"
I have downloaded the trial of livecode platform, i cannot test my application since test button is inactive on toolbar. Is it because of trial version or something else? If the Test or Test Target options are disabled the first thing to check is that you have the Android SDK installed and set up in your Preferences and that you have the emulator running. You also need to have Android selected in the Standalone Application Settings. no, if you have an Android trial license and the license has not yet expired, then you should be able to test your application on the Android Simulator and Android Devices. It is more likely that you have an error somewhere else. I would recommend contacting support (support@runrev.com) with the details of the error message. They should be able to help you with the problem you are having. 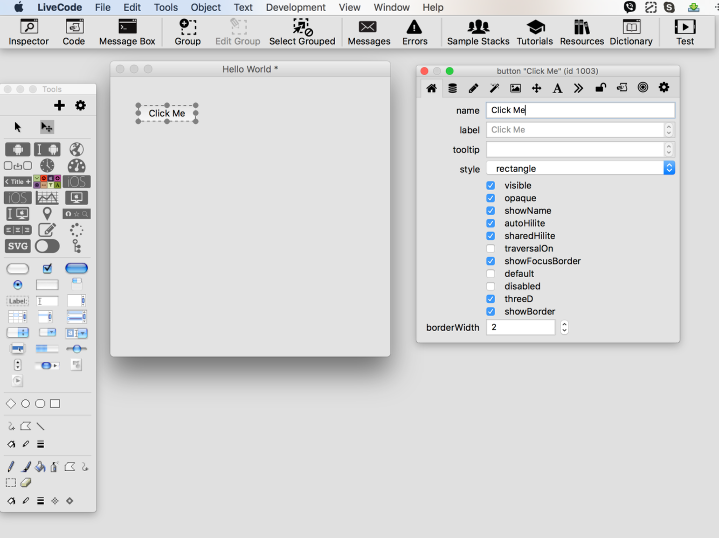 I followed the steps, and when I test, the emulator launches an app (I think), but screen is just black - No button. It also seems to be using a lot of CPU cycles. it can take some time for the emulator to start up the first time, and the screen is initially black. This changes after a while, and you should see the text "Android" on the black screen. This changes again and after a while you should see a working Android interface with a default login screen. You should wait until you see the login screen and log in before you try to test something on the emulator. Yes, the emulator is CPU intensive, especially during startup. Depending on the CPU and RAM, it can take several minutes. I have the same issue as Bill. The emulator is already running and all ready (on home screen). I click "Test" and it builds etc. then installs on the emulator no problem. Then it executes it and I get the same - just black screen with no button. I tried on a phone with the right Android OS version and it fails to install. Doesn't tell me why though. I managed to resolve it (sort of). It seems like something is not quite right, because it only works when I deploy it to a newer version of Android (either emulator or a physical device). I've tested it on emulator running version 3.0 and also on an Asus Transformer also running 3.0 I think and then it works. This shouldn't be the case, because the application is set to only require 2.2. RunRev told me they managed to reproduce the issue and a bug has been raised. 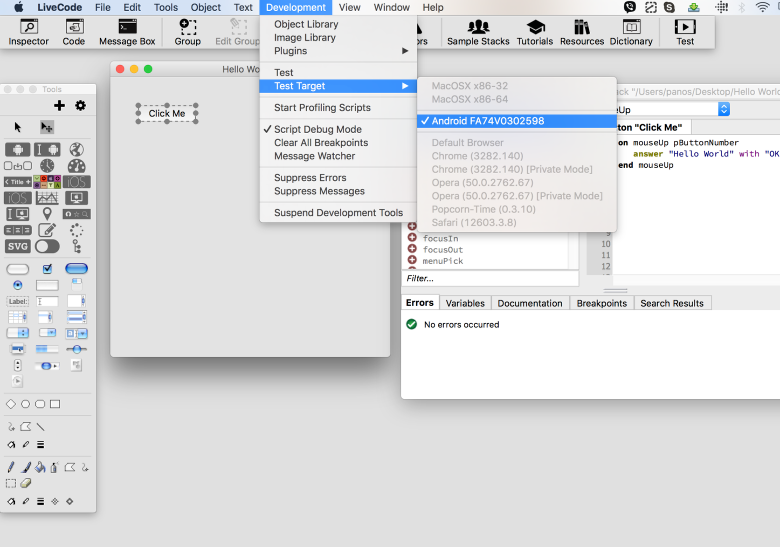 there appears to be a problem between revision 2 and 3 of the Android 2.2 SDK Platform. You can work around the problem for revision 3 by setting the Accelerometer, Magnetic field support and Orientation support to "no". You can do this when creating a new AVD or updating an existing AVD. Next to the table with the label "Hardware" you should find a button called "New...". Click this button and select the mentioned hardware features, one at a time. Then select the value for each of the features and change it to "no". Dear sirs, i have a problem with livecode 5.5 and the emulator, i have installed it on an imac i3 4 gb ram lion 10.7.3 i followed the steps you say..but the livecode tell me this "Unable to build app for testing: could not compile application class"
this error is most likely to be raised when you have an invalid Android Identifier. I had trouble testing the 'hello world' program on the android 2.2 froyo emulator...i figured out i needed to keep open the 'Standalone Application Settings' window, as I selected the deployment target and launched the test target. once you have made the selections you should be able to close the windows and LiveCode will remember what you selected. Can be a little bit fiddly to get everything communicating the first time, but once it is up and running, it should go quite smoothly. Thank you Hanson. I'll have to use the latest release. By the way, I made a workaround on this one on my end which is currently working. 1. In Livecode 5.5.5, I renamed the folder "Android" to something different such as "Android1". This folder is located under Contents/Tools/Runtime. This is fine as far as it goes but I need to receive input from the keyboard on Android. Someone on the forums pointed me to the mobilecontrol functions, and I have seen the lesson "How do I use Native Text Controls on Mobile". However it is still not very clear to me how to go about doing this. Basically I want to know how to set up an input field so as to receive input which I can then go on to process. This code can be executed in the preOpenCard message to set up the text input control when the user goes to the card. I am a beginner, installed LC latest version and did the "Hello World' lesson. However testing the app on Android (Tablet, Mobile Phone as well as Simulator Windows 10) all fails with "Unfortunately .... has stopped". How do I access the error log on Android. I have used Logcat and other apps, to try and get the errors, but do not see anything in the log files. Where can I find info on how to get to the errors logs on Android with LiveCode? And see if that works better. If not please let us know, along with what OS you are on and we will look into it.